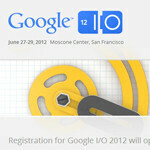 Google’s I/O conference is often one of the hottest meetings of the year for Android-related news. I/O keynotes are frequently where new versions of Android are shown off, and where new mobile services are demonstrated. And, for attendees, there’s often some high end swag to be had. Past shows have given away Nexus phones, Android tablets, and a host of other devices. Of course much of I/O is spent in smaller meetings aimed at developers, and parts of the meeting delve into areas like Chrome that are not as directly involved with mobile (although Chrome for mobile devices clearly makes this more important this year than last year). With all the information and gifts that are on hand, tickets tend to sell out very quick (counted in minutes, not hours). So if you want to go, you need to be ready to hit the purchase button right away. And when will tickets go on sale? March 27th turns out to be the lucky day, at 7AM Pacific Time. It looks like you’ll need a Google+ account to register this year, and be ready to pay for it with a Google Wallet account (hey Google, you might wanna work on your subtlety there!). For more information, be sure to check out the source link below. Are any of you planning to attend? $900?? damn..i'd rather buy a new phone! !